The HVEE 2008 (VB ActiveX Controls) provides Windows GUI software engineers with numerous Visual Basic (VB) Activex Controls that have been thoroughly designed and tested also are engineered to help you create modern interfaces without writing much line of source code. Create rich, Professional User Interfaces. The HVEE 2008 (VB ActiveX Controls) combines 25 (Twenty five) of our most popular vb Activex Controls ..., all for one incredibly price.! These and many other unique and "developer-friendly" features make the HVEE 2008 (VB ActiveX Controls) the absolute essential VB ActiveX Controls for user interface (GUI) development and has been prepared for cutting your development time drastically. By that reasons, I invite you to download the fully functional free trial version of the VB Activex Controls and start integrating HVEE 2008 VB ActiveX Controls into one of your existing programs right away. The HelpVistaXPDiamond Enterprise Edition is fully developed by using Microsoft Visual Basic 6.0 version. 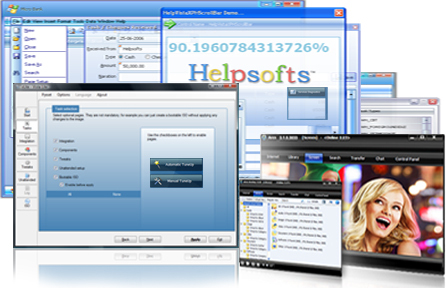 It is an activex controls software. Over 700 more software companies in the world have been bought it for their software development needs within the last 5 years. This software has a big demand in the world. You can earn million dollars selling this software. We have decided to sell our the full source code & the rights of HelpVistaXPDiamond Enterprise Edition 2008. Either you can compile the source code as it is or you can modify it to suit your needs as you wish. The resulting compiled software may be distributed royalty free.